Los Angeles, CA – September 4, 2018—CBRE Group, Inc. has hired Mark Lamp as Executive Managing Director of its Healthcare practice, which delivers facilities management, project management, advisory and transaction, and consulting services to U.S. healthcare systems. Based in Chicago, IL, Mr. Lamp is a forward-thinker with deep experience within Fortune 50 medical device, healthcare software, service and pharmaceutical companies, including GE Healthcare, where he worked for 17 years. CBRE Healthcare includes over 3,450 professionals with expertise spanning compliance, capital markets, facilities operations, advisory and transaction services and business analytics. The healthcare practice group manages 100 hospitals and health systems that span more than 164 million square feet and include inpatient, outpatient, acute care, long-term care, ambulatory care, research and academic centers, and medical office buildings. As part of CBRE’s focus to help clients reduce occupancy costs and generate greater capital resources for clients, CBRE Healthcare recently issued a report highlighting how the $1 trillion of real estate owned by U.S. hospitals can be managed to enable more efficient, patient-centric operations. 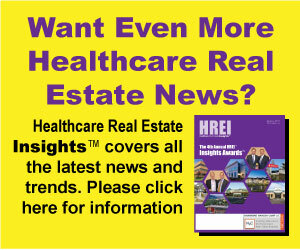 The report notes that core hospital real estate (inpatient facilities) account for more than 42% of all health-care real estate in the U.S. and that outpatient facilities—many of which are hospital-affiliated—account for another 27%. CBRE believes cost savings of 10% to 12% of total real estate costs may be achieved through outsourcing real estate services. CBRE achieved robust revenue growth in the second quarter, as reported in the firm’s quarterly earnings report issued August 2, 2018.